Discovery Yachts was founded 23 years ago by Michael Locatell CPYB and Elizabeth Locatell to serve the Offshore & Coastal Cruising Community. The Locatell’s have been boaters for over 38 years and have owned sailing & power yachts in Oregon, Washington, Alaska, Sweden and France. The Locatell's are the past owners of a Linssen 320 Dutch Sturdy Royal steel trawler and have just ordered a new Linssen Grand Sturdy 35.0 Sedan!. 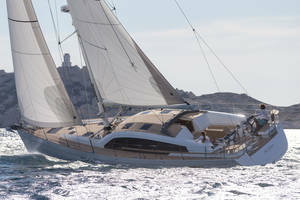 Discovery Yachts specializes in new European yachts, importing over 40 new semi-custom yachts to North America. To insure the yacht meets your specifications we travel to the European yards 2 to 3 times during each yachts construction. New yachts imported by Discovery Yachts are built to North American standards in regards to AC electrical, propane gas, and safety systems. Due to Discovery Yachts efforts, it has won the Sail Magazine Top 10 award three times and Cruising World Boat of the Year award three times with its demonstrator yachts. With Michael & Elizabeth's yachting and racing experience in North American waters, the Caribbean, Sweden, Greece, Côte d'Azur and Michael's Cape Horn Circumnavigation, we are eager to help our customers find the right new or brokerage yacht or to help our customers market an existing yacht. Today, Discovery Yachts owner's Michael and Elizabeth are the North American importers for Linssen Motor Yachts of Holland, and are the North America West agents for Wauquiez Sailing Yachts of France. 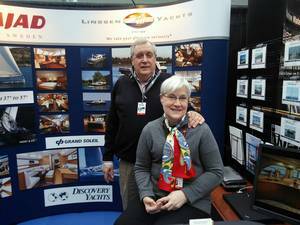 DISCOVERY YACHTS IS AT THE BOAT SHOWS! Visit Discovery Yachts Display Booth for, Linssen Steel Trawlers & Wauquiez Sailing Yachts at South Lake Union, Seattle WA Friday January 25th to Saturday February 2nd 2019! A business that began life as a small boatyard in 1949 has become a market leader in the steel yacht building sector within three generations. Linssen Yachts is a byword for steel displacement yachts of superior quality and for continuous innovative product and process development. In each decade since the company was established, Linssen Yachts has been the driving force behind innovative ideas for modernizing the yacht building process. And it remains so today! Linssen yachts are built in a series of 10 models and of course, Linssen would be delighted to build your dream yacht to your specifications. In fact, they do this every day already – in series, that is! Logicam technology enables Linssen to specify mass-produced hulls in such a way that they eventually come out at the other end as individual yachts. You will be astounded by all of the functional details, things that go to make life on board a joyful experience. Thanks to their unusual chine-type hull, these boats are highly stable and their new shape below the water line combined with the shape of the keel and the rudder, and the rudder balance means that they are easy to pilot in reverse, even counter to the propeller’s direction of rotation. The Linssen boatyard is an impressive complex with a surface area of more than 484,000 square feet. Production is divided between two locations (Maasbracht and Echt). All in all, a very impressive process that you can hardly do justice to here on paper. We have had the chance to inspect Linssen Yachts while working at European Boat Shows over the last 10+ years, and to visit the Linssen Yard 8 times. Linssen Yachts and the yard are very impressive to say the least, so much so, we bought a used Dutch Sturdy 320 Linssen Yacht for our own use, and just ordered a 2019 demo Linssen Grand Sturdy 35.0 Sedan! With our assistance your new Linssen Yacht will be every bit as unique as you are. You can make it just as exclusive and special as you like. Linssen Yachts now builds models from 30' to 50'. 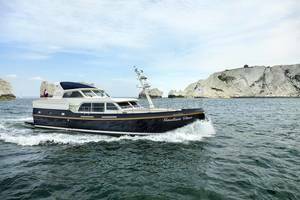 Discovery Yachts has just been appointed the North West American agent for Wauquiez Pilot Saloon Yachts of France. Wauquiez Yachts have a soul! A lifetime devoted to building extraordinary boats, that was the destiny of Henri Wauquiez, who gave his name to our workshop in 1965. For a boat to qualify as a Wauquiez there is no need to pile on the superlatives. A single word is enough to capture the essence built into each of our yachts: quality. We have not chosen the path towards industrialization, we prefer to let our know-how flow freely by offering you original, authentic boats. Boats that are safe, performing and comfortable for all those whose lives are marked by a passion for the sea. NW Yachtnet's twelve yacht brokers working from our 3 North West offices have hundreds of years of combined experience in helping Yacht buyers build their new dream yacht, or to find the right Brokerage Yacht. 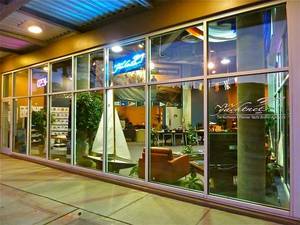 The team of NW Yachtnet Seattle Brokers are eager to share our knowledge with you. So stop by and meet the Seattle office crew, Michael Locatell CPYB, Louie Nelson Broker, Dave Cheaney Broker & Elizabeth Locatell. Whether you are looking for a new or brokerage, Sailing Yacht or Motor Yacht, we will work as a team to assist you in finding a Yacht that is right for you. If you are thinking of selling a brokerage Yacht please contact our NW Yachtnet Seattle CPYB brokers at 877-215-0559 or 206-301-9104 to learn about NW Yachtnet's unique Sellers Broker Yacht Marketing programs! For more information regarding Linssen Motor Yachts or Wauquiez Sailing Yachts please contact Discovery Yachts at 206-285-1096 or e-mail us at yachtinfo@aol.com. As an officer and President of the Northwest Yachts Broker Association, Michael helped found the nationwide program for Certified Professional Yacht Brokers a few years ago in an effort to raise the level of professionalism in the North American Yacht Brokerage industry. 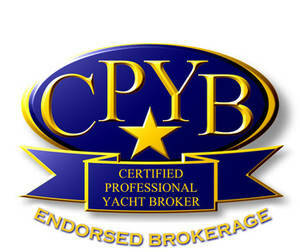 Not only is Michael one of the first CPYB Yacht Brokers in North America but Discovery Yachts & NW Yachtnet are one of the few West Coast Yachts Brokerages that are CPYB Endorsed Brokerages.